It took director Yang Li-chou 10 years and a stream of producers to complete his documentary project “Father”, charting the disappearing of one of the traditional Taiwanese performing arts, Budaixi, the glove puppetry, and the destiny of a family. “Father” had finally the international premiere at the Hong Kong International Film Festival and is at the moment touring the Festival circuit. 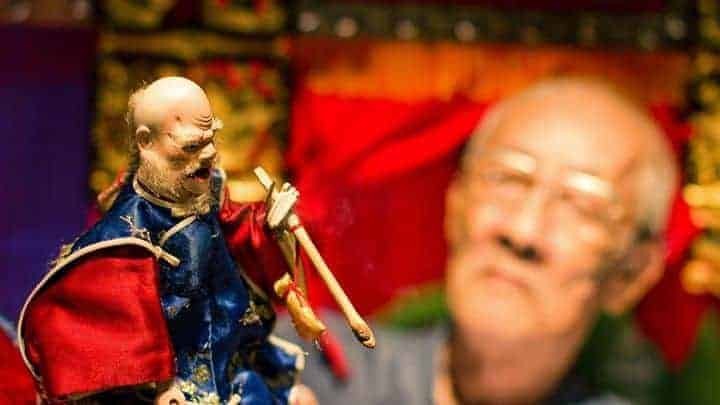 The documentary focuses on the elderly puppet master Chen Hsi-huang and his determination in preserving this form of art and passing it on to the next generation. In the opening of the movie, we see his beautiful old hands showing the movements that animate the puppets in a mesmerising graceful dance. The fervour in teaching and coaching for free anyone willing to learn is the relentless engine behind this man. Budaixi has often been politically charged, banned during the Japanese occupation, resuscitated as propaganda later, now struggling with the disappearance of Taiwanese language. The puppet actions are in fact intrinsically linked to a rhythmic recital of Taiwanese verses, a language that (like Cantonese in Hong Kong) is quickly and sadly disappearing, making Budaixi one of the endangered Taiwanese cultural heritages. Nevertheless, in one scene Chen performs without words for an audience of hearing impaired children with astonished results. But the real soul of the film is the troubled relationship between Chen Hsi-huang and his father, the legendary Master Li Tian-lu and the struggle to overcome the looming shadow of his celebrity. The international audiences might know Li Tian-lu for his roles in Hou Hsiao-hsien’s “Dust in the Wind” “Daughter of the Nile”and “City of Sadness” and because Hou’s “The Puppetmaster” is based on his life from childhood to the end of the Japanese occupation. But in Taiwan, Li is a real national treasure. Born in a puppet master family, teacher of many international artists and founder of the Almost Like Life Budaixi Troupe, he is revered as an iconic Maestro and a real celebrity. Li had married his wife into a family higher in the social ladder and consequently had lost the privilege of giving his name to the first born. This is why Chen Hsi-huang carries his mother’s surname Chen. In the strictly patriarchal Taiwanese society, this “shame” resulted in Lin’s never feeling close to his eldest son and keeping always a sad emotional distance. Chen learned everything from his father, often in the hard way, but never felt a connection with him and after his death he decided it was time to break free and create his own company. Nevertheless, the scars of years of repressed feelings and neglects are all there. Chen couldn’t escape the fate and he is now a distant father himself (his son hasn’t follow him in the profession) and has reserved all his love and attachment for his puppets, his disciples and the little red box containing a statue of General Lee, Saint protector of Puppetry. In a very touching scene, Chen is lost for words when asked to say something to his late father, and instead he cannot stop the flow of words when asked to talk to General Lee. Not surprisingly, the original title of the movie is translated “The Red Box” and ironically overlaps the English “Father”, like in a sort of psychological transfer. Yang is an accomplished and established documentary director and “Father” is formally beautiful, mixing footage of Chen performing for international audiences and actively working on his preservation project in Taiwan with some amazing studio recording of hand movements and actions, including an amazing performance without Taiwanese text, that shows to a foreign audience the incredible range of emotions that puppets can display. The score mixes traditional music with some very moving original pieces that underline the more intimate glances on Chen’s life. Director Hou Hsiao-hsien – who is executive producer of the film – is also one of the talking contributors of the film, having known Chen’s father and witnessed his hardness towards the son. Yang grew up watching the puppet shows, like many children of his generation, and his film is not only a passionate tribute to a disappearing craft but it actively contributed to initiate some action from Taiwanese government and also spawned the creation of a library of tutorials and recordings of Cheng’s movements and Budaixi’s characters. With its duplicity of intents, “Father” is a reminder of the importance of traditions but also a thought provoking observation of the damages that role models can do and a prompt to carefully consider them when dealing with our own children.